Did Catholic Bishop Louis Kébreau, President of the Haitian Episcopal Conference, call on Haitian President Michel Martelly to be ruthless and dictatorial? “Sweet Micky” was the name of Martelly’s vulgar konpa music persona, whose greatest claim to fame was as the principal cheerleader for Haiti’s bloody 1991 and 2004 coups d’état. “Sweet Micky” defended and celebrated the repression that followed Aristide’s overthrows, during which a combined total of some 8,000 Haitians were killed. Now President Martelly remains without a Prime Minister because both of his nominees – Daniel Gérard Rouzier and Bernard Honorat Gousse – were staunch defenders of the coups. The Parliament rejected both of them. The Catholic Church hierarchy has a deplorable history of backing repression in Haiti. The Vatican, virtually alone in the world, recognized the Cédras military dictatorship of 1991-1994. Recent Wikileaks published byHaïti Liberté have exposed the Vatican’s behind-the-scenes encouragement of and collaboration with U.S. efforts to undermine Haiti’s elected government prior to the 2004 coup. After the coup, the Vatican told U.S. officials that it had “no regrets” about Aristide’s ouster. 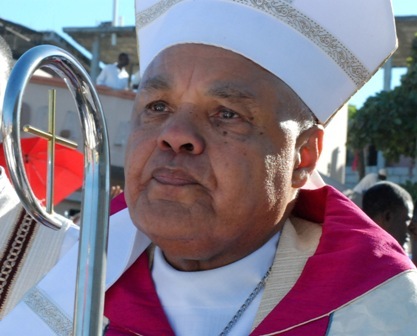 I am outraged by Bishop Kébreau’s hypocrisy and brazen partisan intervention in Haitian politics. I was a Catholic altar-boy at St. Claire’s church in Ti Plas Kazo under the late Father Gérard Jean-Juste. He was a vocal supporter of Aristide and a courageous resister of the coups. For his defense of the poor and repressed, Father Jean-Juste was suspended from carrying out his priestly duties and three times imprisoned by the government of de facto Prime Minister Gérard Latortue (2004-2006). It was Bishop Kébreau himself who signed the letter to suspend Father Jean-Juste from his sacerdotal functions in 2006. Nor did Kébreau ever speak out against Father Jean-Juste’s illegal and brutal imprisonment. While human rights groups from around the world, including Amnesty International, called for Jean-Juste’s release, the Catholic hierarchy supported Jean-Juste’s punishment with a Pontius Pilate-like silence. But Kébreau is ready to break his silence to support a neo-Duvalierist who came to power with a tiny mandate in an openly rigged election. None of this is surprising for anyone who has followed the Catholic Church’s role in Haiti's political affairs since even before the nation’s independence in 1804. The hierarchy has always been on the side of the elite – about 5% of the population. My prayer is this: May the Catholic Church’s hierarchy become, one day, promoters of democracy and social justice, not of despotism and social injustice. Amen.